There’s a new talk in town. I’ve written before about Creative Nites and Mornings. Now, there’s one more design-y event you can add to your roster: IXDS Pre-Work Talks. IXDS is a Berlin-based service design agency and their extending their operations to Munich. They’ve been hosting these talks in their offices in Berlin for some time now, you check them out here (scroll down to ‘Past Events’). 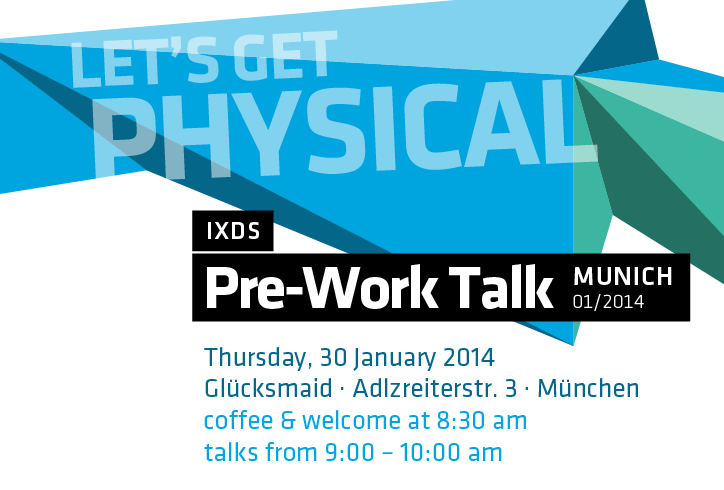 The first ever Munich Pre-Work talks is on Thursday, January 30 starting at 8:30 a.m. at Glücksmaid (so much good stuff happens there!) The theme is ‘Let’s Get Physical’ stressing the importance of the physical within design. You can sign up to attend at their Facebook event page. This sounds great! I'd love to come, but the Facebook event page is closed. Maybe one has to be invited to RSVP? Nice! Unfortunately they always do this events during the working week. Why don't they do it on Saturdays or (even better) Sundays, when people who work have time. Hi Nina, hmm, I don't know why the event is closed, but I know for a fact you can just show up, so don't worry about it. Hi Kalibu, Yeah, well I think the idea is to host them early enough so that you can catch it before work.